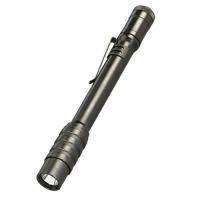 Streamlight offers the Stylus Pro USB Flashlight, a handy pen light that allows for convenient on-the-go recharging via a USB cord or an AC wall plug. The powerful, white C4® LED provides a light output of 70 lumens. Activate the Streamlight flashlight with the push button tail switch and shift between two modes: momentary-on or steady operation. The body is constructed of sturdy, machined-aluminum alloy with a Type II MIL-Spec anodized finish. The glass lens is gasket-sealed and a sliding metal sleeve over the USB port protects it from water damage and impact up to one meter. One full battery charge provides up to 3.5 hours of run time. The impressive lithium ion battery efficiently recharges in 2.5 hours and can be recharged up to 300 times. Each Stylus Pro comes with a USB charging cord and a matching holster. An AC wall adapter can be added to the package for an additional charging option.